The Bureau of Land Management has switched tactics and is now offering up to $1,000 to anyone who adopts a wild horse in an effort to "encourage more adopters to give a wild horse or burro a good home." The agency said in a statement that it will be providing the funds under its Adoption Incentive Program for anyone who decides to take in an untrained wild horse or burro from the agency. BLM's goal is to reduce the department's "recurring costs to care for unadopted and untrained wild horses and burros while helping to enable the BLM to confront a growing over-population of wild horses and burros on fragile public rangelands." Under the new program, qualified adopters are eligible to receive $500 "within 60 days of adoption of an untrained wild horse and burro" and another $500 "within 60 days of titling the animal." BLM's ongoing battle to control the exploding equine population has been nothing short of challenging according to agency officials. The government organization, charged with population control since 1971, recently had to put the brakes on an Oregon's Warm Springs Herd Management Area (HMA) spay research project. 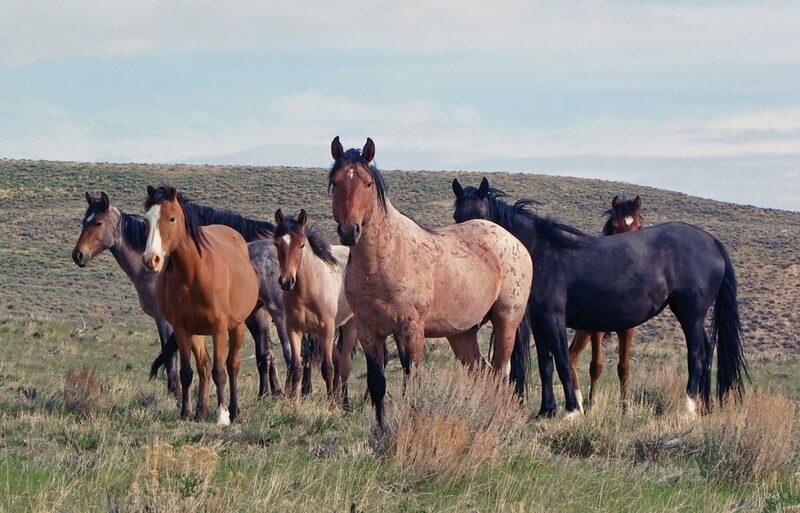 BLM officials say along with increasing adoptions, management plans are still in the works for not only Oregon's overpopulated wild mustang herds, but also in other overpopulated states. Jason Lutterman, BLM public affairs specialist, said that there are still a number of research projects ongoing. BLM uses the latest science in its efforts to ensure that viable populations of wild horses and burros can thrive on healthy public rangelands. For example, the BLM uses science to monitor rangeland vegetation, soils, water, wildlife habitat, and the effects of wildfire, and the BLM relies on sound science and monitoring data to determine appropriate management levels (AML) for wild horse and burro herds. The demise of Oregon's spay project, which was science supported, was hailed by wild mustang activists, but Lutterman said it is not necessarily the end of the spay topic. "There is nothing that prevents us from restarting a spay research project," Lutterman said. "There was a lot of misinformation distributed about spaying." For Oregon, on Feb. 15, BLM released for public comment, an environmental impact study on permanently removing some of the wild horses and burros from the Warm Spring HMA, and the proposed return of 66 of the animals to the range, with the mares treated with porcine zonapellucida. According to Lutterman, there are two options for birth control in the mares. Currently the most commonly used agents are porcine zona pellucida (PZP) vaccines that were developed starting in the 1990s. Two versions of the vaccine are currently in use ­— one version, known as Zonastat-H, is implemented through ground-darting programs and is only effective for approximately one year. The second version, known as PZP-22, is effective for one to two years but must be hand-injected into a captured wild horse. The PZP-22 runs upwards of $300 per animal. The Zonastat-H is less expensive at around $30 per dose. Tara Thissell, Oregon's Warm Spring HMA Public Affairs Specialist, said BLM is committed to stabilizing the wild horse population. "Soon after the close of the comment period on the DNA (Determintaion of NEPA Adequacy), the BLM may issue a decision that authorizes it to return approximately 66 wild horses to the range, or at least the number needed to achieve appropriate management level in the HMA based on the results of an upcoming population survey. 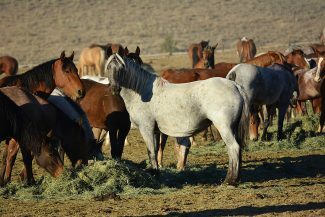 Animals not released to the HMA will be prepared for the BLM adoption and sale program. The BLM is committed to achieving and maintaining a stable, healthy population of wild horses in the area at AML." Wild horses and burros qualified for federal protection in 1971. The 1971 Wild Free-Roaming Horses and Burros Act and the BLM identified the approximate management level, to be about 25,000 head. As part of its efforts to manage the population growth of wild horses on public rangelands, the BLM has supported the development of an effective contraceptive agent for wild horses since 1978. Over the years, attempts at different approaches — such as hormone implants or chemical vasectomies — were tried, but abandoned as ineffective or impractical. But the reality is that BLM is not only fighting the battle of herds tripling every six years, but they are battling wild horse activists with deep financial pockets that sway the public and courts. Last September, The Cloud Foundation, Ginger Kathrens, the American Wild Horse Campaign, along with other groups, filed the complaint in U.S. District Court in Oregon that shut the spay project down. The groups claimed spaying carried "a high risk of mortality from bleeding, infection, and evisceration, as well as a potentially fatal protrusion of bowel through the surgical incision," along with other complications. "This is a rare, last ditch operation in the world of domestic mares," said Kathrens, the Cloud Foundation's executive director and a humane adviser on the BLM's Wild Horse and Burro Advisory Board. "I would hope we, as a society, are beyond this kind of cruelty." But spaying of mares is not a new concept. One common misconception is that the "greedy ranchers" want the range lands for cattle. While some of the mustang herds do share ground with cattle herds, some of the most overpopulated areas have no cattle on the HMA. The growing equine numbers are detrimental to other species, including elk, mule deer and sage grouse. 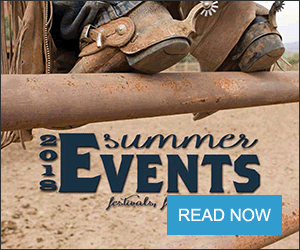 "We have plenty of herds that there aren't any livestock, and those herds are in perile too," Lutterman said, pointing to eastern Nevada and Wyoming herds. One group, the National Horse & Burro Rangeland Management Coalition, is an advocate for the wild horses, but supports rangeland management and submitted public testimony last fall to BLM, on the overpopulation threatening the health of rangelands. Representing more than 10 million Americans and 18 national organizations, NHBRMC includes sportsmen, livestock growers, state and local governments, resource management specialists, professional land managers and others concerned with the management of horses and burros in a commonsense and ecologically sound way. In September 2016, the National Wild Horse & Burro Advisory Board recommended that BLM should "offer all suitable animals in long- and short-term holding deemed unadoptable for sale without limitation or humane euthanasia. Those animals deemed unsuitable for sale should then be destroyed in the most humane manner possible." In the testimony, NHBRMC chair Ethan Lane and vice chair Lia Biondo stated: "We understand that the recent recommendations were not easy ones to make but are critical and were undertaken only after careful review of the dire situation facing the wild horse and burro herds, native wildlife and our public rangelands. Because it reflects original congressional intent and will help resolve the current wild horse and burro overpopulation crisis, our coalition supports the advisory board's recommendations." The testimony points out that since the 2016 recommendation to euthanize some unadoptable horses and burros, the population has grown from 67,027 to 81,951 animals. The testimony details BLM's failed management actions. "Under the current management approach of removing approximately 3,500 animals per year with 18 percent growth, and barring massive die-offs, the following population numbers are likely: 107,000 animals on the range by 2020, and rising to 348,000 by 2028," the group writes. To ensure healthy rangelands for future generations, NHBRMC urged the National Wild Horse & Burro Advisory Board to: (1) re-emphasize its previous recommendations that encourage the secretaries of the interior and agriculture to implement the management tools needed to achieve ecologically sustainable wild horse and burro populations within a reasonable amount of time, (2) encourage BLM and the U.S. Forest Service to increase the number of animals removed from the range in order to restore and protect rangeland habitats and (3) strategically apply sterilization and fertility control drugs on herds once populations are at management goals, where such methods are deemed effective and cost efficient by scientific evaluation. BLM gathered and removed more than 9,000 horses and burros during 24 emergency gathers from 2006 to 2015 due to dire animal health situations resulting from poor rangeland conditions, according to BLM reports. "If we wish to maintain healthy herds on our public rangelands, we need to ensure those herds are sustainably managed at appropriate levels," the coalition noted. The wild horses have no active predators, so controlling heard health was turned over to BLM in 1971. In early 2000, Lutterman said adoption rates on horses ran 7,000 to 8,000 each year. Today, on a good year, BLM adopts out 3,000 to 4,000. "It's a much bigger struggle now than it used to be," Lutterman said. Which is why the BLM now manages over 50,000 unadoptable horses in captivity, and continues to look for management tools, like spaying, to not only keep the iconic horses on the range, but keep them healthy. On March 4, BLM announced it was looking for contractors for off-range pastures to provide a free-roaming environment and quality care for wild horses removed from Western public lands. BLM plans to award multiple contracts that can accommodate 200 to 5,000 head of wild horses. 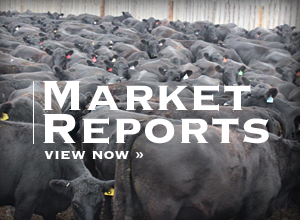 Bids are being accepted for the following states through May 3, 2019: Colorado, Idaho, Kansas, Montana, Nebraska, Nevada, North Dakota, Oklahoma, Oregon, South Dakota, Texas "Panhandle" (only north of Hwys. 82 and 84), Utah, Washington and Wyoming. For more information contact Kemi Ismael at (202) 912-7098 or kismael@blm.gov. Ismael can assist with general questions. A list of frequently asked questions is available at: http://www.blm.gov/whb. As of March 1, 2018, the wild horse and burro population on public lands was estimated at 82,000 animals, which is more than triple the number of animals the land can support according to BLM. "The BLM remains committed to pursuing better management tools that can help slow wild horse and burro herd growth with less of a reliance on removing animals and finding homes for them, including safe and humane methods to spay and neuter horses," Thissell said. The BLM spent nearly $82 million on the horse and burro program in fiscal 2017. This money was used to remove a small number of horses from the rangelands ($4.2 million), adopt out approximately 3,500 horses ($7.9 million) and care for horses and burros in long- and short-term holding facilities ($48.6 million). Costs continue to increase every year, and horse and burro populations continue to grow. For the fiscal 2012-16 period, more than $370 million was spent on the wild horse and burro program, and the result was that an additional 56,000 horses and burros were added to the population, the testimony explained. So, if activists continue to control research, roundups, management and the public, what next? Another growing concern of the wild horse and burro populations — the animals are leaving their herd management areas, in search of water and forage, creating new problems. According to reports, there have been over 400 vehicle-horse collisions in Nevada since 2006 and in Arizona, the Phoenix metro area sees approximately 200 vehicle accidents a year caused by wild burros. And the Heber herd, in Arizona's White Mountains are making news, as they are now on the local welfare list. Last May, several local residents and advocacy groups reportedly took up the cause, delivering thousands of gallons of water to the wild horses, after pictures of the malnourished and dehydrated herd hit the internet. Other herds have similar stories, with each creating new management challenges, including the horses becoming dependent on humans. Bottomline, the cost to taxpayers, rangelands, and even the equines' health, continue to escalate, and there is really one piece to the puzzle.